Their wings would tangle in there when a bird hits it. Nets were staked in the ground around ponds to catch flightless, molting ducks and geese. Murres, a kind of seabird, were taken by driving them into nets on flat ground at their densely-packed colonies. 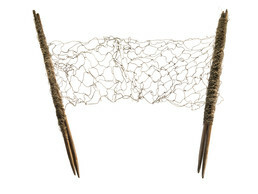 This bird net is made of twisted sinew, with four wooden stakes for standing it up. Elders remembered using hoop nets made of sinew to catch flying auklets. Mary Bourdukofsky: That is for catching a bird. Aron Crowell: How would that work? Vlass Shabolin: Their wings would tangle in there when a bird hits it. . . It has to be for birds because the pegs are not long enough to put into the ground for the chuuchki (least auklet) or whatever. And we can’t put it in the water because the pegs are not too long. The fish would just drag it out of the bay. Mary Bourdukofsky: Maybe two people hold the pegs on one side while another person holds it on the other side. Aron Crowell: Do you think that net would go all the way to the ground once the pegs were in? Vlass Shabolin: Like Mary said, you have one person on one end and a couple others on the [same] end as the sticks, but you have three pegs. Maybe they would spread out along different sections of the net where you stick it in the ground, so when the so when the bird dives and doesn’t see the net . . . they get tangled up. Maria Turnpaugh: It seems like it would be stationary. Aron Crowell: Is this net made of sinew? Knotted together the same way you would a fishnet? Mary Bourdukofsky: Well, it would take a lot of sinew. To me it looks like cotton. Look at it, [it looks] like its crocheted. They must have used it for animals, maybe ptarmigans and rabbits. Maria Turnpaugh: It’s too little for ptarmigans. Aron Crowell: So it’s not a familiar type [of net]?